Today’s guest, Merle Heckman, truly understands the power of storytelling – and why it is needed in all aspects of business today. You see, Merle works with engineers, but he’s not an engineer (he’s the Manager of Organizational Development at Regal Beloit). And when engineers give presentations, they can be dense with jargon and hard to understand… not unlike when accountants give presentations. Merle wanted to know how individuals within his organization could give better presentations, so that the people listening could better retain and use the information being presented. There’s a monthly divisional meeting at Regal Beloit. Every other month, Merle coached the speakers on incorporating storytelling into their presentations, and they did this for four months. So the first month was normal, second coached, third normal, fourth coached. After every meeting, Merle sent two surveys: one two days after, and one two weeks after. The first survey asked questions related to retention, and the second survey asked if they had applied the information, or put it into practice. When the presenters incorporated storytelling techniques, participants put the information into practice 2.5x more often than when the presenters didn’t. When comparing the first presentation (no storytelling) with the second presentation (with storytelling), participants retained twice as much knowledge when there were stories. When comparing the third presentation to the fourth presentation, participants retained 81% more knowledge. “In the business context, the story teaches. We learn how to do things … The story resonates with us in such a way that it really reaches in and it really appeals to us.” Stories give presenters the opportunity to put specialized knowledge into a context that everybody can understand. And if the term story seems daunting, Merle sometimes uses the term “homespun illustration.” The important thing is that we’re not talking about making things up; We’re talking about taking real-life events and real-life situations so that you can draw similarities (or create analogies) to the truth that you’re trying to give, and reinforce it. So what type of stories should a presenter tell? “The best stories are the ones that come from our lives; The best stories are the ones that we have lived.” There are so many stories out of our own personal lives that can affect, inspire, educate, guide, and teach people. The second best stories are the ones we have observed in other people around us. You don’t have to say the person’s name, but explain how they solved a problem. Those make great, relatable examples. The third best stories are the ones that we read about in books, or from history, that are true to life. These are often stories about how the Lincolns and Jobs of the worlds solved problems. Don’t make any mistake: Teaching with storytelling isn’t easy – but it is incredibly effective. In a world with so much information, in a world where everybody has a screen captivating their attention, the story will distinguish you as being different. Peter: [00:00:00] Welcome to episode 85, and today my guest is Merle Heckman, who is the manager of organizational development at Regal Power Transmission Solutions. 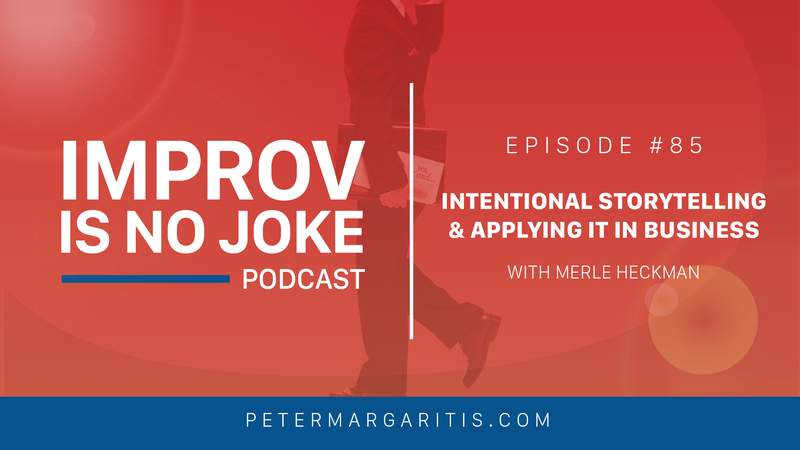 Merle understands the power of storytelling because his doctoral dissertation is titled “Intentional Storytelling: A potential tool for retention and application in business.” So obviously conversation is going to focus on why storytelling is needed in all aspects of business today. Before we get to the interview, I have a question for you: Would you like to operate clearly in chaotic situations and learn how to focus on the things that you can control, and not worry about the things that you can’t control? If so, then consider purchasing my book, “Improv is no Joke: Using Improvisation to Create Positive Results in Leadership and life” for only $14.99. Here’s a review from an Amazon customer: “‘Yes and’ he did a great job opening my eyes (and mind) to concepts. I’m an I am an ex-accountant who also did a short-lived stint as a professional actor. 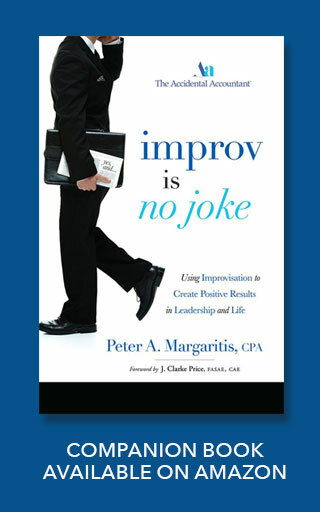 When I looked at the book, I was curious what could Mr. Margaritis tell me about improv or accounting? “Yes and” he did a great job opening my eyes (and mind) to concepts I had long forgotten about, i.e., listening to other people, being creative and accepting positivity. His examples are real and grounded and his use of humor is refreshing. I read the book cover to cover in one sitting because he kept me enthralled on his stories and explanations. I highly recommend his book if you’re looking for some fresh ideas to open your business processes and even if you’re not looking, you will be pleasantly surprised by his experience and approach.” Thank you very much Mr. Amazon customer. Obviously the book can be purchased on Amazon, but if you’d like a personalized signed copy, go to my website, PeterMargaritis.com and click on the Improv is no Joke available now graphic to purchase, and the shipping is free. You can also purchase my audiobook from my website for the same price of $14.99. A professional speaker’s biggest challenge is following up with the audience to continue to provide value added tools and techniques. 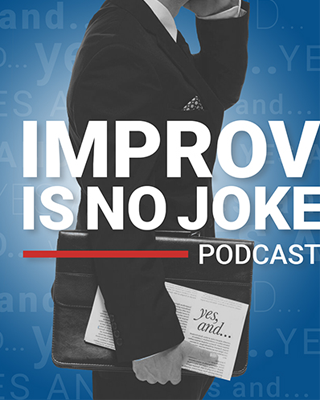 This podcast is one way that I used to deliver those tools and techniques. The other way is through my social media platforms, which are Facebook, Twitter, LinkedIn, and Instagram. Please feel free connecting with me on one or all of the social media platforms, and you can subscribe to my monthly newsletter by going to my website PeterMargaritis.com and clicking the contact drop down button on the menu bar of my home page. Well with that said, now let’s get to the interview with Merle. I would like to thank him for sharing his knowledge and thoughts on ways that intentional storytelling can be applied in today’s business world. Merle, thank you for taking time. I know you’re a very busy man. You’ve got a very big job. I appreciate you taking time to spend with me on my podcast today. Merle: [00:02:59] Hey, Peter, it’s a treat. I’ve been listening to the podcast and learned a lot of good things from your folks. It’s good stuff. Peter: [00:03:06] Well thank you very much. And just so everybody knows, Merle and I go back a couple of years. He was attending a conference, and Jennifer Elder and I had a course that we were offering that day and I was manning the camera for Jennifer and getting some footage and you had to leave early, and I gave you my business card and we just kind of kept in contact over the last couple of years this way. Merle: [00:03:32] Yeah sure enough Pete. So I read the book and then just kind of watched what was going on. Peter: [00:03:38] Why don’t you share with the audience your background? What do you do? And we’ll have a conversation from there. Merle: [00:03:45] Peter, I work presently for a manufacturing company called Regal Beloit here in Florence, Kentucky. I’ve been the manager of organizational development for about nine years. And so a part of that is I do a lot of training, a lot development, a lot of leadership coaching here for my company and my organization. I’ve always been in the human resource realm of work. Before this I was a plant H.R. manager for a couple of years. Before that I was involved in government housing authority in Northwest Indiana for a couple years in HR. Prior to that I worked for a transportation company for about eight and a half years, some operations and got into HR. And before that I did nonprofit. And so I’ve been very fortunate to have a variety of different things for the last I guess now 12 years. I’ve taught as an adjunct faculty member at a variety of different universities. Then I do a lot of work for the Dale Carnegie organization on the side also, teaching their various classes, both live and online. So lots of diversity of different things I’ve gotten to do. Peter: [00:04:54] Yeah it’s pretty cool. I remember you telling me that you were adjunct professor teaching, but you also got your doctoral degree in educational leadership from Northern Kentucky University. Correct? Merle: [00:05:07] Yes. I got there about three years ago and just felt like I’d gone through a lot of the other educational aspects and said hey let’s go for the for the other opportunity there to see what doors it opens up, and mainly just to get stretched and to learn a little bit more. Peter: [00:05:20] So what was your dissertation on? Merle: [00:05:23] It was actually on the idea of using storytelling in business. Merle: [00:05:31] Yeah. I wanted to see– because Peter, I would walk out of meetings and – and we’re engineering driven, we’re manufacturing – and I would walk out of meetings– and I’m not a I’m not a dodo. I’m a very intelligent guy. But I’d listen to some of the presentations that were made, and I’d just shake my head and say I don’t know what was said there. Merle: [00:05:54] I would walk down the hallway and walk beside people said that did you hear what was going on here? I heard a lot of people, unfortunately, shake their head and just say nah I don’t know what’s going on there. So I said What can we do about that? So that’s what prompted it. Peter: [00:06:10] Interesting. So you aren’t versed in the language of engineering. Merle: [00:06:15] That’s that’s the… kind of that’s that’s my breed of people that hang around with. It is. Peter: [00:06:22] And that’s why when I talk about this, and we’ve talked – you know I’m in the process of writing a book – when I have a group of accountants in my audience, I ask this question: How many of you speak a foreign language? And I get a few hands raised. I said Well let me rephrase that. How many of you speak the foreign language of business called accounting?. Peter: [00:06:43] And then they all start laughing and they’ll raise their hand. I go folks, you speak a foreign language. Because outside of the accounting department – the sales, the hr, or the other – they have no idea what you’re talking about. And even if you say it louder, they’re not going to understand it better. And I think they begin to realize that they do speak a foreign language, just as engineers speaking foreign language, and architects, and so on and so forth. Merle: [00:07:11] Well in some ways Peter we all speak foreign languages because we get locked into our fields and we know acronyms and we know details, but probably for engineering and finance people they face it even more. A greater challenge. Peter: [00:07:28] Ok we said acronyms. SHRM stands for society for human resource management. Merle: [00:07:34] Yeah, we better clear that one up. Peter: [00:07:38] Start throwing acronyms around like crazy. So tell me about tell me about your dissertation. Tell me about your research. This is this is fascinating. And just so the audience knows, we’ve known each other for a couple of years, but it wasn’t until late last week that I learned about this. Merle: [00:07:57] Yeah I don’t float that out there. You know just normal Merle, that’s what you are. But one of the great parts of the doctoral program in Northern Kentucky University, Peter, is they believed in something they called Action Research. So we did we did research, but they wanted to see it in practice. They want us to have dissertations that could be plugged into workplaces, and to be a benefit to people not just theoretically lost in the dark hole. So we came up with an idea to do an experiment here at our location. This was the divisional corporate office for our company. Every month, the president of our organization would hold a one-hour meeting, and the managerial staff was invited to come to it. About the first 20 minutes, the president would speak about the numbers for the previous night and to give an update of different things. Then he would invite somebody on his staff to make a presentation about their particular area of specialty. Again, just to try to educate people. Get people in here. I approached the vice president of human resources and then approached the president and said here’s my proposal and explained to them how I believed that storytelling could help us as an organization, and then I had this opportunity through through the educational process to work towards a degree. So what we did was we set it up where for four months in a row, one time a month, the 60-65 people would come into the meeting, and the first meeting would be business as usual. It’d be normal. The third month, business as usual. No changes. But the second and the fourth month, the president, and then I was given access to whoever is going to be the speaker. I worked with them, coached them, gave them some ideas, or gave suggestions. How could you incorporate things like a story, a word picture, an analogy? How could we use that and see you present something like that in your presentation? And so I think it was a real educational process for folks. I’ll say a bit about that later on too. But that’s the way we did. So the very first time that we did this, Peter, I explained to people in the audience “Hey I’m working on an advanced degree. We’re doing some study about communication. You’ll be receiving some e-mails with surveys from me,” because Peter I didn’t want to tip the hand that oh we’re going to do stories and see if it’s different. I want us to try to keep the information clear. Sort to follow up we would send an e-mail two days after the presentation and two weeks after the presentation. So these folks would respond and they were asked questions like What do you remember? What stood out to you? and sometimes what suggestions would you give to the presenter to make it better? And the one that went out two weeks later, we would ask them Peter if they were able to take something they heard and put it into practice and have some action application to it. First month was normal. Second month, again, the president came out with his great analogy of where he used Thanksgiving dinner and talked about… I’m not sure how he did it, but he explained trade working capital through the use of a Thanksgiving dinner. Merle: [00:11:56] Yeah, but again: the power of analogies. Merle: [00:12:00] The power of the way to look at things in a language that people could understand. Third month same. Fourth month he again gave an analogy, the speaker gave the analogy, and Peter we kept looking at the surveys and watching them. When all the surveys were in, we studied them closely and here were a couple of things that really stood out to us: First of all, we saw that the amount of activity application went up a great deal. We found that people were able to put into practice two and a half times more when there were stories, compared to the regular dry presentations, if you please. They were able to take things they had learned and put them into action 2.5 more times through the times when they heard stories. Merle: [00:13:00] I would say it’s because they could remember, understand it, and grasp it even better. Another key note that we observed, Peter, was the fact that we said– we asked people well write what you remember. Well from the first time the second time, people wrote double the amount of what they remembered from the presentation. From the third time to the fourth time, they wrote 81 percent more. Now we could debate exactly what that means, but one thing I would say is that people walked away, and when they heard stories they remembered so much more and could recount it two weeks later. And Peter that that’s exciting stuff. Peter: [00:13:50] Yes it is. Merle: [00:13:51] Words can do that. Peter: [00:13:52] Yes it is very exciting stuff. Merle: [00:13:57] I believe that many people in business are somewhat terrified of stories. They look at stories as being ah Come on. We’re well educated people and they believe that it may be pretty to use stories and to talk about them. But in reality, what we want to do is get things across to people where they can remember them and they stick with them. There’s a statement that we use a lot here at my workplace to try remind people that, and it goes like this: People will remember your stories long after they forget your slides. Merle: [00:14:41] And I believe that. Peter: [00:14:42] I do too. Merle: [00:14:45] I think there’s some different… I think there’s just something about stories that we’ve overlooked. A part of it is that I think we fail to realize that we tend to be story-driven as human beings. Peter: [00:15:01] Yes we are. Merle: [00:15:02] For those folks who go to movies, what’s a movie? It’s a story, and then the whole science of what makes the movie and the story so good is an element that could even be used as we tell stories. Peter: [00:15:17] So let me ask you this. How how– since there’s some fear or whatever, how do you define story to the business community? It’s not it’s not once upon a time, and it’s not making stuff up. How did you define that in your dissertation? Merle: [00:15:35] Well we were very careful to say that story — you’re right, because people hear story and they think nursery rhymes, or I’m just lying and making up a story. Merle: [00:15:48] I very clearly told our people that it could be– I even used the term a homespun illustration, like the Thanksgiving dinner. But we’re not talking about made up things. We’re not talking about lying. We’re talking about sometimes taking real life events and using them, or real life situations, and how can you draw similarities with the truth that you’re trying to give to reinforce it. Peter, you know, as I told you, I teach a lot from the Dale Carnegie organization. Merle: [00:16:26] And I learned a lot about facilitating, not just lecturing but facilitating, through Dale Carnegie organization. And even though Carnegie lived a long time ago, he used– He had a book about public speaking, and if you ever read the book How to Win Friends and Influence People, you’ll see it’s filled with stories and illustrations to represent the people principles he taught. And Carnegie said one time, “I have 30 human relation principles. I could have put those in about three pages. But I used the other 240 pages of the book of real life stories and real life situations to let people see and hear and understand and illuminate them even better.” Peter, I think in the business context, the story teaches. We learn how to do things. How does that person face that situation? How did they handle that challenge? That was a tough one, what did they do? The story resonates with us in such a way that it really reaches in and it really appeals to us. Peter: [00:17:42] It’s it’s putting things in context that everybody can understand, and taking out the technical jargon the buzzwords and stuff. Like you said, everybody has sat down for Thanksgiving dinner. Everybody’s had an experience with a Thanksgiving dinner. So everybody understands that. I did something in Arizona some years ago that was a highly technical topic called consolidations of VIEs, variable interest entities. I’m not going to bore you with the details, but basically this is what brought Enron down in these off balance sheet items, and the standard setters they can use to as well as you know have them consolidate onto the balance sheet. And the night before I’m looking at my slides like Oh my God. I’m going to put everybody to sleep. Peter: [00:18:26] And I said what’s the lowest common denominator? What are these guys trying to do? Well they’re trying to move something from here into here. They’re trying to move something in that this place doesn’t want it. And I came up with this idea, and what I did was so– I asked the question for me got into the materials. How many of you all are married? And I got these real funny looks. It’s like 200 people in the room. All these hands went up and I said OK, how many of you have a mother in law? And the hands stayed up. I said I want you to think of your mother in law as a variable interest entity, and your spouse wants their mother to move and consolidate into your household, aka balance sheet. Merle: [00:19:08] Yeah, how’d that go over? Peter: [00:19:08] And everybody went from I’m going to do the conference prayer and look at my phone to Holy cow, what? And it was a homerun. And when I do go back to Arizona, the people that were in that audience say You’re the mother in law guy, right?. Peter: [00:19:26] And I know I got a really cool last name, but I love it when somebody says you’re the mother in law guy because they got it. Merle: [00:19:33] Well Peter, think about that. I mean there are some even great business books out there of… shall we say of allegorical story for. Take the book Fish, about Pike’s fish market. Merle: [00:19:46] Up in Seattle, and the lessons they teach about that. Probably the best when I can come up with is the book Who Moved My Cheese. Merle: [00:19:55] Because what that guy did was he took a strange, simple story. When I worked for the trucking company, the book had just come out and the owner of the company had been in a conference and gotten the book. He called me to his office when he came back and he said I got an assignment for him. I said sure what’s that. He took the book and he tossed it to me, and he said read this book. Figure out how to teach it to our people because we’re always going to go through change. Now, Peter, I’m sure a lot of the listeners have listened to Who Moved My Cheese. But I always say, it’s a great guidebook, and there’s three reasons: It’s a great guide book because number one it’s got about a hundred pages. That’s just for us guys. Merle: [00:20:42] Number two, got big print. Another winner for us guys. And Peter, do you wnat to dare guess what the third one was?. Merle: [00:20:51] It’s got pictures! Merle: [00:20:54] That’s a great guidebook. But I’ve told that story at various– I don’t do it anymore because it’s kind of been overused– but I’ve got locations where I was at eight years ago, and I’ll go in, and as I walk in the door people see me and say hey, you’re the cheese guy! And they’ll still say my cheese is being moved. They’ll laugh about it. That’s cool. It’s all through the story. Peter: [00:21:22] It’s all through the story. Merle: [00:21:25] And Peter, I think all of us ought to have a concern about if we can say something that resonates with people. We don’t want to just stand up in front of a group of people and have them endure it and get out the door and forget everything. I have a book in my library that I strongly encourage the listeners take a look at. It’s called Made to Stick. It’s written by two brothers, Chip and Dan Heath. One of them is at Stanford and one of them is at Duke University, and they’ve done a lot of practical research. And the book Made to Stick, I referred to it a couple of times in the dissertation. It has to do with How do you get ideas to stick with people? How do you get it to stick with them? When you see the book, the cover is intriguing. It’s an orange colored book that says made to stick, but it looks like a piece of duct tape on the front. Not real duct tape, but it looks like it. In made to stick, there is an excellent story that they give that explains why people struggle with, and probably why engineers and accounting people struggle, and the short story is entitled “Tappers and Listeners.” Tappers like you tap on the table. A lady was working on her dissertation from Stanford University. It was a dissertation in communication, and she used as a resource this experimental game. She asked for two groups of volunteers. And Peter one group would volunteer to be tappers. Merle: [00:23:23] The tappers were given a list of songs, commonly known songs, that basically everybody would know. Songs like Twinkle Twinkle Little Star, Happy Birthday, Jingle Bells. Mary had a little lamb. Songs we learned when we were kids. And the tappers had the responsibility to practice taking their song and tapping the notes to it on a desk. That’s what they were supposed to do. Merle: [00:23:54] After they had time to practice, then they were going to bring in a second separate group of volunteers called Listeners. And the listener was going to sit across the desk from the Tapper, and the Tapper would tap the song and the listener would have to guess what it was. Now Peter before the tappers had practiced but the listeners hadn’t come yet, and they asked the group tappers what percentage of times do you think people will recognize the song? And actually they said 52 percent. We think 52 percent of the time people will recognize the song. They brought the people in. A hundred and twenty five songs were tapped. Merle: [00:24:49] And the number of songs that were recognized were three. Merle: [00:24:56] Yeah. And the tappers said man there’s no way. No way. But Peter, when I teach this to groups of people, I will sometimes say OK let me tap a song. Let’s see if you can guess it. It will be one everyone of you will know. So I’ll have the song on my desk and I’ll say ok. Guess what is. Guess what is. And I’d say 99 percent of the time nobody can guess it, and what I’ve done is I have tapped the Star-Spangled Banner. And I said wait a minute, you didn’t you couldn’t figure out the Star-Spangled Banner? And I say that facetiously. But if you think about it Peter, all they’re hearing is random taps. In my mind, I hear the orchestra before the ballgame. In my mind, I hear the singer singing the national anthem before the game. I hear all of that in my mind. And then I tap and I filled in my mind, but they don’t get that. All they hear is these random taps. And the lesson that lady drove home to her dissertation, Peter, is that we have to be careful that we just don’t have it in our minds and don’t get it out to the people in a way they can understand it. Peter she even knew — she coined the term the curse of knowledge. She said many of us, when we learn something, all of a sudden we think everybody else knows it. Merle: [00:26:47] Peter, I’ve been in courses and I’ve had to to steer away from speakers that were financial people in our organization, and they were told hey teach finances for non-financial people. And I will tell you some of our best people that work in the financial department would get up and they’d rattle with terms that they live with today by day by day. And you look around the crowd. It’s just a gaze – or glare. That’s what it is. The glare on their eyes. It’s the curse of knowledge. Peter: [00:27:27] I like that. I like that analogy. The curse of knowledge. Merle: [00:27:31] It’s a great one. Merle: [00:27:32] And sometimes, to my friends that have heard me teach that, I’ll teach something or they’ll teach something and they will realize it didn’t go over very well. We will say to each other after, I as tapping today but I didn’t do much. Merle: [00:27:51] Hey Peter, one other thought on that just to wrap up that idea. After we set the stage for that and talk about the lessons that she gave, I say to folks let’s imagine that we went out. It’s a sunny, warm afternoon. We walk as a group to a picnic at a park where there are picnic tables and pavilions up, and you look over and you see a table. There’s a bunch of gifts on the tables, streamers, balloons. A bunch of little kids singing, standing around singing, having fun. And all of a sudden you hear this song and I tap out Happy Birthday. I said what did I just tap, and they said Oh happy birthday. I said Yes that’s it. I said I have to set the context. I have to set the situation to where you can see it in your mind, and then you can grasp it. That’s the great thing about stories they help us set the stage. They help us put in a context that people can get and understand. It’s not just spur of the moment stories, although sometimes you get them, but stories and illustrations and analogies ought to really be thought out ahead of time, and ought to be considered for which would be the best and the most appropriate story to use in the situation. And that’s what’s got real benefit. PETER. That’s got great benefit to it. Peter: [00:29:29] Yes. And when I talk about financial storytelling with my audience, I tell them write it down when you come across a story. And so how I’ve kind of helped my audience, when I’m talking about story… All good stories have a hero a villain. And then, as Bill Stayton talks about stories, you run the villain up the tree and you throw rocks at them. And they’re looking at me like What are you talking about? Let me just change: instead of hero and villain, every good story has a challenge or a problem. And every good story has a hero, and the hero solves that problem. So if you look at storytelling on how you solve a problem, because that problem is the villain, you’ve got more stories in front of you than you really know about – and you have to write them down. Merle: [00:30:27] That’s it. And it’s looking forward day-by-day things we do, or work situations. Peter I believe the best stories are ones that come from our lives. Merle: [00:30:39] The best stories are the ones that we have lived. The second best stories are the ones we have observed in other people around us, and we’ve seen different situations and see how they handle it. And we don’t ever want to you know do something that hurts being anonymous. We’re not trying to say something about somebody that shouldn’t be said. Merle: [00:31:04] But there are some times people in our organizations step up and they do some great things. And if we get permission, we could tell those stories. You don’t have to tell the person’s name, but say this is how they did it. This is what they did. Those make examples. Merle: [00:31:24] The third best are ones that we read about in books that are true to life. Those are the best when you know people will talk about what Churchill did this, or Abraham Lincoln did this, or that person. That’s the resource of stories, but far and above, Peter, there are so many stories out of our own personal lives that affect people, can inspire, can educate, can guide, and can teach. So we don’t want to just quickly say Oh I don’t have any. That’s stories so far from being accurate. They just need to address them, and look at them. And Peter what stories– you think about it. When you went back there to Arizona where you taught and you told your mother in law story, the next time you got to speak there was some pressure to say oh man. Now they are expecting something. I guess I have to come up with something else. Did you feel a little pressure?. Merle: [00:32:23] But all of a sudden you get the reputation of people who can tell a story, and people say man I want to listen to that lady. I want to listen to that man again because they tell something to hold my attention, and they let me laugh a little bit. In our situation, we had one of our presenters who was not really known for having a great deal of charisma, if you please. Merle: [00:32:51] Very knowledgeable. When that person turns to storytelling, it was like people were writing to me and said oh my god can you help this person do that every time? Because when they do that, I learn, I understand, and it is great. And think of the folks in your audience Peter. If our folks can hear this and that could be a way we’d be known, we’d be much more effective, much more respected, and quite honestly we’d enjoy it even more. We’d enjoy it even more. Peter: [00:33:30] Yes. And I think the challenge out there is it takes a lot of work to craft to craft that story, to think about it, to put that analogy together, and I think some people – because of the workloads because of what’s going on in their lives or whatever – choose to not do that because of the amount of work it is. Merle: [00:33:55] It is. And Peter I have to give credit to my family. As you know, my wife and I have seven children. Now they range from 37 years old down to 20 years old. But guess what part of the dinner table conversation was as my kids were growing up. Dad was practicing a story, and I’d get critiqued by the tough crowd. Teenagers. But I practiced. I’d practice telling it to the cat. I’d practice it, and that idea – the greatness is not in the performance. The greatness is in the preparation. Peter: [00:34:43] Yeah. Ding ding. Merle: [00:34:44] I’ve stood in front of the TV in hotels and practiced what I was going to say. Practicing the wording of it all. Peter: [00:34:52] Practice practice. We’re not talking about the game? We’re talking about practice!. Merle: [00:34:58] Good ol’ Allen Iverson. Peter: [00:34:59] Oh yeah yeah. And I mean it is tough, but you know it… it works. And just like you said, there are stories everywhere. And what I’ve learned… so my wife was the first one to get me to realize that I spoke a foreign language. Now she’s not an accountant. She managed a general manager for Macy’s department store for many years. And when I was doing– when I was in public accounting early on in our marriage, and even through that… “How was your day?” And I would go immediately into accounting speak, and she’d go quit talking Greek, Chinese, Japanese to me. Tell me what you did, and I struggled at first. But then she just… and I just kept finding a way to make that connection. I didn’t realize it at that point in time, and then as a member of the National Speakers Association being exposed to some of the best storytellers out there, I began to realize there are stories everywhere. You just have to write them down and come back and catalogue and craft them. Because analogies and these things can work in so many really great ways to make that connection. And I also learned that when we deliver a story, if we want to make it stick, all stories there’s emotion. There’s some type of emotion, whether it whether it’s sadness, happiness, anger, laughter, and that’s an emotionally charged event. And the more that we can add those in to our presentation, the more the information will stick, as you have demonstrated through your dissertation and teaching the story and these stories stick, and the retention rate dramatically increases – and that’s really what we’re in business to do, increase retention, right? Merle: [00:36:47] Peter, we in business are terrified of the E word: emotion. But it has such power to open things up. Peter have you ever heard a speaker by the name of John Maxwell? Merle: [00:37:06] And maybe some folks in your audience have. I would strongly encourage people to go on YouTube and watch John Maxwell. My wife heard him speak at a convention, and Maxwell speaks around the world. He speaks a lot. Very well known as an expert in writing leadership books. But he spoke to a convention she was at that had about 20,000 people several years ago, and she understands the idea of what we watch foreign speakers. And Maxwell laid it out real carefully. He says you know I’ve got three main things i’m going to talk about. He alluded to them, then he said hey here’s the first idea I want to leave with you. He told it, laid the foundation, and then Peter he went in and started telling a story, and it was a story that got people kind of laughing. It had like you said the ups and downs of a person, and the emotions opened up. And then he came back and drilled that first point really clear, again. Number two, laid the foundation, different story, different situation, got some laughter, got a bit sadness, but used that as such an effective tool to plant the seed. And I want be real clear Peter. When I talk about stories, I’m not talking about funny jokes. I rarely tell a funny joke. Well if I tell a joke in public, it’s not funny right, right? So I don’t do it. Merle: [00:38:41] Just a homespun, the way you tell things you’ve experienced and lived. Great example: We aren’t talking about being a jokester, although there is lightheartedness, especially when he pokes fun at ourselves. Peter: [00:39:07] It is, and I was going to say that there’s a difference between jokes and humor. Merle: [00:39:12] Exactly. Exactly. We never want to say anything at the expense of anybody else, and I think that maybe part all people are stories we think are you just going to be comedy. That’s not what we’re doing at all. There’s there’s good place for good tasted humor, but never at the expense of somebody. Peter: [00:39:29] So the example that I give as a joke is something like a priest, a rabbi, and Bill Clinton walk into a bar. You’ve offended somebody already just by saying it. Peter: [00:39:40] Humor as in a sense of I’m talking to a group about parenting. And I would say I would say something like you know what, my son who’s 17 years old. I got the best, I mean the best compliment he’s ever given to me, and he told me the other day that I was a buzz kill. Merle: [00:40:02] Hahaha. I don’t know what that is. Peter: [00:40:03] I said that’s like getting an exceeds expectations on a performance review. That’s humor versus the joke. Merle: [00:40:15] Haha. Right. Because you’re telling real life, and people admire that. Peter: [00:40:21] Yeah. To your point, there are three areas to come from: from home, from family, from life. And I was raised in a Greek American household. There are stories everywhere in that background. And I also agree that you know telling the story of what Churchill said or Kennedy said or Jobs, and bringing those in, also has a lot of power in helping with that retention, with increasing the retention level. And you know we’re in the information exchange business. When you’re in front of an audience, we’re exchanging information, and if we are Tappers, the likelihood that… maybe 10 percent might remain when they leave the room. The goal is to increase that, and we can increase that story, through the examples that you have given. Merle: [00:41:16] Peter, to me, there’s so much information. The story will distinguish us as being different. It will make us be unique. And the goal is not to plop out 20 different stacks of information. The goal was to give people something they can walk away with and grasp and benefit from, and that’s the beauty of it. I learn from other people. I see how they did. I see the faced it. I learn those stories, and it’s like that got such a refreshment to it, to the people who hear. And so for folks that aren’t used to this, I challenge them to just be a bit daring and to take the risk and work and craft a story, and to try it, and just see how it goes. And it’s a great opportunity. It’s a truly great opportunity. Peter: [00:42:13] It is. I ask audiences do they watch TED talks, because a lot of TED talk is very technical information but delivered through story, which is engaging, there is humor in it. Ken Robinson talked about how schools were killing creativity, and he starts out with a story about his child. Watch a TED talk. Watch it for the content first, but then go back and watch it again and see how they’re weaving story in with the data, with the technical side of it. Merle: [00:42:57] You know another aspect that goes along with that Peter is, if you think about it, we often hear people talk about how we live in a world of screens. Young people are used to looking at screens, just as adults look at screens all day long. They’re well crafted. They’re flashy. We watch TV. We watch theater. And we get this screen and this amazing effect that’s on the screen. And then all of a sudden we come into an auditorium or meeting room and the speaker is showing blah PowerPoint that’s not got lines everywhere, and that we can’t sometimes see, or can’t understand, and we speak in a monotone voice and we wonder why we can’t hold people’s attention. As a presenter, we have to be better today than we’ve ever been because we have competition like we’ve never had before. Peter: [00:43:51] Exactly. And you know I’ve watched how I’ve evolved over the years from way back in the day any more. I’ve got one slide a picture and basically just one thought few words and then it’s a conversation around that piece. And if I can enhance it through story, but we tend to put– go to youtube and watch Death by PowerPoint. Peter: [00:44:21] That’s just don’t want to do. Merle: [00:44:25] Hey Peter, I used to work for Emerson. They were a Fortune 120 company. And during that time we were the Emerson, I helped write a program called Safety Leadership Skill. And it was an eight hour program where we wanted to teach people not the nuts and bolts of safety, but we wanted to teach supervisors how do you encourage people to be safe? How you encourage safe lifestyle and all those things? And that presentation had, for eight hours, had forty eight slides. And most of those were pictures or big words. So we would laugh because when people, when we started rolling the program out, people would say 48 slides? Well that’s good for the first 45 minutes. What are you going to do the rest of the time? And it was all facilitation. Merle: [00:45:18] It was stories. It was illustrations. I mean that program went around the world. 25,000 people got trained in it simply because people said wow, this is refreshing. This is different. We’re not glued to the PowerPoint. The message is the speaker. We as speakers are the message PowerPoint is just a quick supplement. That’s what it should be. Peter: [00:45:42] It’s an aid, but we use it as a crutch in so many so many ways. Merle: [00:45:47] Oh. Spot on. Peter: [00:45:50] We’ve abused we’ve abused PowerPoint, but I also found that we’ve trained the audience to expect PowerPoint. And I did a keynote a few years ago and I wasn’t going to use PowerPoint. It was all through memory, through story. And I was watching the crowd and they were a little confused. And I actually got OK reviews, not what I was expecting. And I was talking to some folks about it and they said your audience– CPAs are expecting slides. Why don’t you try put it maybe three or four slides together for your talk and use that? And my evaluations went up dramatically. I went from 4.1-4.2 to a 4.7-4.8. Just by putting a few slides in. Merle: [00:46:45] Well, Peter, you’ve had some adjunct faculty experience. Merle: [00:46:49] You know I teach a lot of online classes, but I teach several on a regular basis live classes. And I go in the first night and say folks, we’re going to do this a little different. I’m not going to use PowerPoint. I’ve got a few simple handouts I’ll give you all the way. And I say you know would that be all right? And what I find is they find it so refreshing because they have just had people get book Power Points and just kill them all. And again it’s that facilitation. Let’s tell a story. What’s your experience? And with adult learners, let’s hear your story. Let’s hear your experience. Merle: [00:47:26] And they’re teaching, again, through stories. Hey Peter. Think about it. How many of us, growing up, our moms or dads or grandparents or aunts or uncles told us stories to teach us life lessons? We still retain some of those today. That’s where it’s at. It’s really where it’s at. Peter: [00:47:47] You’re spot on with that. We’ve become so linear, so data driven, that it’s become very numbing, and the ability to– and when I talk about storytelling, there’s so much to it because, one, you first have to be comfortable in front of an audience. Two, you have to be confident that you understand the material and that you’re well versed, you’re well practiced. You’ve gotten past that fear of public speaking. And once you get past that, because now you’ve created the conversation versus a presentation. Then you can bake in that story, and then the audience will remember it much more so than if your body language is not congruent with the words that are coming out. Your audience is immediately going to just disconnect from you. Merle: [00:48:38] Yes. Peter, when I teach presentation skills classes for the workplace here, one of the things I always put on the back the value of stories is we talk about are our people, in our audiences, are they going to be spectators or are they going to be participants? And I heard that phrase several years ago in this context: It talked about people that were going to professional football games, or even your beloved Ohio State football games. And during the game, you have 11 players on offense, 11 on defense. You’ve got 22 players on the field who desperately need some rest. And you have 50,000 people in the stands, or maybe more, but they desperately need exercise. And that’s the idea of the audience. Are they going to be participants? Or are they going to be spectators? And stories let people be participants; interaction lets people be participants, not just staring at you blah blah blah blah blah blah blah the whole time. Peter: [00:49:45] You just told me a story about that and used it very well on using the analogy of a football game. Peter: [00:49:54] I haven’t I haven’t heard that put like you like you just did. And I love that. That’s that’s excellent. Merle: [00:50:01] See analogies. Great way to tell a story without really telling of story. It’s a great way to get people thinking, get them involved, get them to be a part. And that’s when people say you’re in this class already? It seems like it just started because they were a participant and not just watching the clock. That’s it. That’s really it. Peter: [00:50:26] And I just last month, I was in South Carolina with the South Carolina association. I did a program discussion leader Academy I trained the trainer, and we did two and a half days. We had participants, and they were used to doing not so much facilitation. And at the end of the program, they were just astounded they their presentation skills within two and a half days changed dramatically. They got it, talk about storytelling and just body language and stuff. And it was just like night and day. And the challenge I left them with is you gotta keep this in front of you. You got to keep practicing. You just can’t do it here and then you leave and go back to the same way you’ve been doing it. It was a waste of your time and mine. Merle: [00:51:11] Exactly right. But when people try and take a step in that direction, Peter, I mean folks, all of a sudden not just to the participants this happens you know the audience get better, but I’ve seen people that just picked up this idea and said I’ll try it, and they saw how it worked, and all of a sudden they say it is so much more fun presenting. And guess what? The audience senses us when we are that way. They sense– you know Carnegie always talked about tell us something that you’re familiar with. Tell us something that you know about, that you live, that you’ve experienced, and relive it. And go through the experience. He said you do that, you’ll draw a crowd of people to you. And that’s what we’re encouraging people to do with the story right there. Peter: [00:52:00] Exactly. Man this has been so much fun Merle. I just you know what… You know we could probably talk for two hours on this topic, but you know maybe we’ll have a follow up on this conversation. After my after my book is published and you’ve had a chance to read it, we’ll come back and have a conversation and you can give me a critique, and we can have a discussion along those lines and then bring in something new that you’ve learned. Because you’re just a wealth of knowledge my friend. Merle: [00:52:31] Well I believe that to continue learning is the only way to go. I mean no matter how many degrees you have or how old you are in life, if we don’t have that curiosity, that hunger, to say wait a minute, I want a little bit more… And good for you Peter to take on a group of people — they’re good good peoplem they just haven’t given much thought to could I present a different way, and your work is trying to encourage that and to help that. Good for you. Peter: [00:52:59] I appreciate that. And the book, more or less, will I think be slanted more towards the accounting profession because it’s what I’m accustomed to. But I think if those who are not in the accounting – engineering, architecture, or anybody – can pick it up and read it. They’ll get a sense of it, a sense of understanding of the power of storytelling and things that you need to do. And it’s not accounting jargon driven. There’s just a lot of examples. A lot of my examples come from what I’ve witnessed over the last 20 some odd years in the accounting profession, and things that I’ve done in my presentations and things that I’ve thought about and attempted. And so I think it’s a book that anybody could pick up and read and use. But I think it is a little bit more slated towards the accounting profession. Merle: [00:53:47] Peter, this is probably the final thing I’d have to say is I oftentimes strongest in presentations we tend to do what we’ve seen done before. It’s safe. It’s comfortable. And yet there’s something in all of us, I believe, that once we start hearing these ideas as you know maybe could be different. Merle: [00:54:08] I have found that we were willing to step out and be a bit daring, try something different. I always told my kids don’t be like everybody else when they give a presentation. Don’t do it. Presentations are a dime a dozen. Do something with a with a prop. Do something different. Do something with a story that captures attention. If somebody is daring enough to try it, they’d be amazed at the step in the right direction that they’re going. It’s worth their while. Peter: [00:54:41] Exactly. As we say in the improv world, follow the fear. Peter: [00:54:52] Don’t back away from it. Follow the fear because it is into the unknown. But you know we say get outside your comfort zone. That’s another way of just saying follow your fear. Try it. You know what, if that doesn’t work, then assess it, rework it, try it again. Eventually it will, or you’ll come up with another idea. Merle: [00:55:11] It’s worth breaking out of the mold. Yes sir. Peter: [00:55:14] Well I appreciate. I know you’re busy man. I appreciate you taking the time. I thoroughly enjoyed this conversation. I’m walking away a richer person today because I didn’t know this information, that dissertation stuff, and what you’ve shared… like I got goosebumps my friend. You gave me goosebumps today. Merle: [00:55:35] Well it’s been my pleasure, and it’s been a privilege. We just want to help other people say let’s make it better for ourselves and for our organization. That’s where it’s at. Peter: [00:55:44] Exactly. And I appreciate everything, and I look forward to our next conversation. Merle: [00:55:51] That’s a winner. All right. Thanks so much.